Restrictions: No part of this recording can be posted on the Internet or published in any form or in any venue. This recording can be used by visitors to this website for educational and limited classroom use only. Koh Ribbon Olam [Master of the Universe], Song for the Shabbat table, written in aramaic. From the recording Songs of the Gerer Chasidim. Copyright Aderet Recordings. All rights reserved. Courtesy of Aderet Recordings. Reproduction prohibited. Yankel Talmud was the composer of the Gerer Hasidim. He lived in Poland before the war and directed the Gerer choir in Gora Kalwaria. 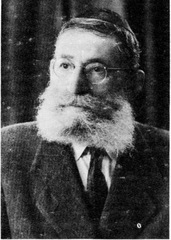 In 1933, Reb Yankel Talmud moved to Israel where he continued to compose 'nigunim' [melodies] and hasidic music for the Gerer Rebbe in Israel. He died in 1963.